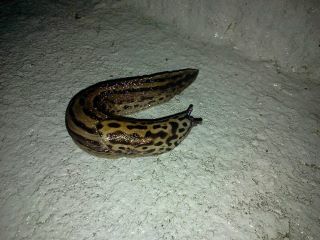 Slugs are hardly uncommon around here, but this sucker was HUGE. Must slugs I have known and grown acquainted with are usually the size of, say, pen caps, and more often than not just remind me of snails that got drunk and lost their shell on the long crawl home. But this guy was easily the size of two or three index fingers, giving him more of a look of a small fat snake with antennae. He looks the charmer, though, doesn't he? I'm pretty sure from the looks of this snapshot that he is wearing what the equivalent in the slug world is a three-piece suit--notice the abrupt change in pattern. Perhaps he was on his way to a charity ball that was cancelled due to excessive rain. I envision that his name is something like Nathanial Slugston III, but his friends commonly refer to him--due to his exploits in college--as Slugger McMucus. Either way, he will most likely be gone in the morning, which is probably for the best, since my dogs would refer to him kindly as breakfast.